THE ELECTIONS HAVE BEEN OVER FOR NEARLY TWENTY MONTHS. Half of Americans are rejoicing, the other half cursing over the election of President Donald Trump. Regardless of how you voted or whether you are happy or sad, laughing or mad, there’s something you can do that can and will change the course of this country, influence the governance of our new President and grant you a semblance of peace no matter your political persuasion. That’s right, instead of demanding a recount, wishing for a third party candidate or smashing Trump’s Star on Hollywood Blvd. you can make a tangible difference in how America can indeed be made great again. In other words, instead of complaining about what a lousy job everyone in Washington is doing, tell God about it. 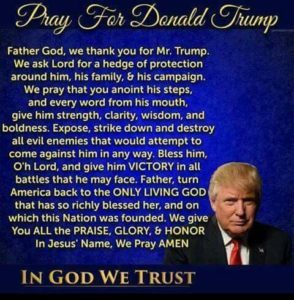 I found eleven short things we can pray about for our new president on the Web and thought it might be more helpful for all of us to talk to the Lord about them instead of whining, complaining and hiding in “a safe place” on a liberal university campus being coddled by a clueless, godless professor. Now, isn’t that a more productive use of your time instead of wasting another minute posting a sarcastic meme on Facebook? 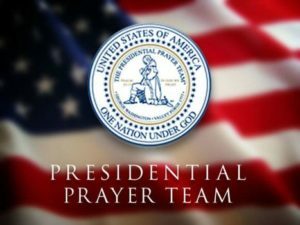 Also, have you signed up yet for the Presidential Prayer Team? They give you daily specifics on how to pray for the President and those in power. Click here to sign up.